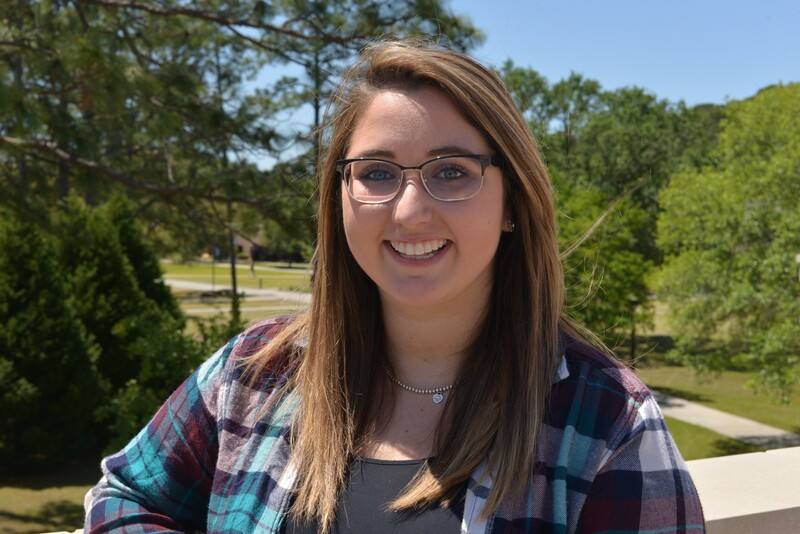 Macy Patten, '19, reflected on her time at the College of Coastal Georgia so far with fond memories and a lot of smiles. "This experience at the College has been life changing and has built me from the ground up," she said. "I believe that if I went to another college, I wouldn't be as successful as I've been here." Patten became president of the College's Student Government Association last fall and is a member of Overboard Entertainment, an organization that works under the Office of Student Life to provide innovative, fun, educational, and cultural events for the student body and community. Patten also gives campus tours to visiting parents and prospective students. She is very involved on campus but her time at the College didn't start that way. Patten is originally from McDonough, Georgia. She grew up visiting St. Simons Island to enjoy the beach and, once she heard that the College was so close to the Island she loved, she knew the College of Coastal Georgia was where she wanted to be. "The moment I stepped on campus I knew I belonged. I'm from a small high school and I didn't want to go to a big college, because I didn't want to be a number in the crowd," she said. Although she loved the College, Patten practically lived in her dorm room her freshman year. She didn't go out and had no desire to get involved on campus. However, when some of her friends didn't return to the College for sophomore year, she was determined to make a change within herself. "My sophomore year was all about finding who I was by myself and realizing that I had to put myself out there in order to make friends," Patten said. She became close friends with fellow student Foster Hayes who introduced her to people on campus, SGA, and Overboard Entertainment. "Now when I walk through campus, I can go 10 feet and see five people that I know. Coming out of my shell was my biggest struggle. But I've realized that is what life's about—forming relationships," Patten said. "You're not always going to have somebody to smooth the path for you, but at some point you're going to have to get up and get out there." One thing that really made Patten step out her shell was joining SGA in January 2017 during Hayes' term as SGA president for the 2016-2017 academic school year. Patten served as the Director of Student Feedback on the Executive Cabinet. She was then elected vice president for the 2017-2018 school year. When the new president of SGA stepped down this Fall, Patten served as interim president. She was encouraged by advisors to run for president. "I was really nervous about running," she said. "I was nervous that I wouldn't have what it took to be president and run SGA. I won the election and it's been a really good year for SGA." As SGA President, Patten has worked to create relationships on campus, with members of the community, and with members of the College of Coastal Georgia Foundation. SGA has helped Patten become a better communicator and sparked an interest in state politics. "Running for SGA president definitely wasn't a political move," Patten said while laughing, "I just wanted to get involved and help change the campus in a positive way." Her position also involves being a mediator between the student body and College administration. She admired how Hayes listened to students' concern and gave students feedback on things happening at the College. "I've noticed as a president that you can't change everything on campus. There's a reason why things are the way they are. It's made me more appreciative of what our faculty and staff do for students," Patten said. "They really do have our best interests at heart." Behind the scenes at "The Most Magical Place on Earth"
In the fall, Patten will start an internship at Disney World. She was accepted in February into an internship program and will work with different attractions. Disney World is very important in her life. She recalled first visiting the park when she was 8 years old for a surprise trip. She and her siblings have gone to Disney many times over the years, and it continues to be a source of fun and memories for her family. "When I found out that Disney had an internship, I knew that was something I wanted to do," Patten said. "I'm really excited to see how Disney works behind the scenes and what goes into the park." Patten talked about the overnight transformation the park undergoes from fall and Thanksgiving decorations on the last day of November to holiday displays for the first day of December. "It's really magical that they can flip the park upside down and change it completely into something different, and I want to be a part of that. I'm very excited," she said. Through the internship, Patten hopes to gain more experience in interacting with guests and children. As well as developing production, leadership, and problem-solving skills, all of which she hopes to use in a future career in the hotel industry. Patten is majoring in business administration with a concentration in hospitality and tourism. Her dream job is to join a reputable hotel brand and be in charge of building and opening new hotels and resorts. Patten's advice to students, and especially incoming freshmen, is to get involved. "Students who are involved are the students who stay at the College. If you get involved on campus, you will be more successful," she said. "I know it's scary and hard to find where you feel like you fit, but that's okay. If you put yourself out there, people will accept you. In my opinion, if students stick it out and find their niche on campus, they'll be really happy here." Patten found her niche with the Office of Student Life. It is a place where students can find clubs to join and discover where they fit on campus, she said. "When I graduate, I'll be proud to say that I'm an alumna of the College of Coastal Georgia. What we have here is really special," Patten said. "The interactions we have between students and faculty, staff, and the administration would not happen at a larger school. I think that's really important here. As Foster Hayes says 'We're a college where the professors know your name.'"